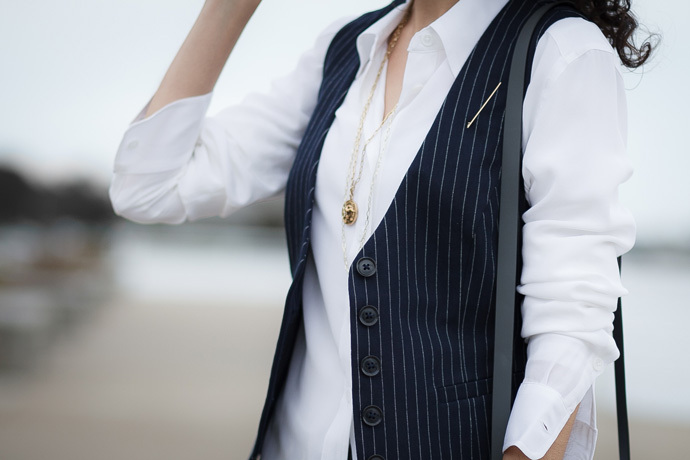 If you like pinstripes even a little bit, take note that Banana Republic has some good ones right now. 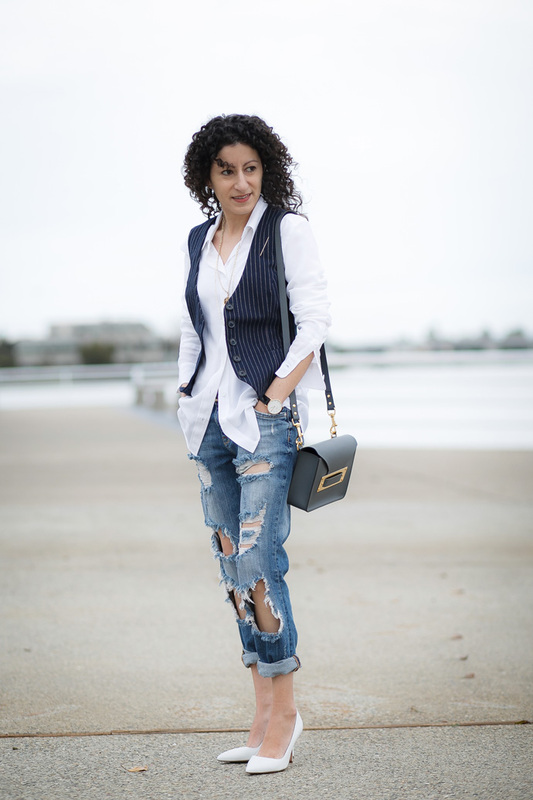 My favorite is this short vest (I had it slimmed just a tad for more shape), but I also love this blazer and pair of slim pants. If you like dresses, there’s one of those too. Oh, and a midi skirt. May this embarrassment of riches never end! The scientist in me likes rules. I like standard operating procedures and repeating patterns. Experimentation might be fun, but its end goal is to find a working repeatable solution to a problem. When it comes to fashion, I’m no different. I enjoy discovering fashion formulas, and I’ve studied “the rules” like research papers. For instance, being petite, I know I should avoid baggy clothing, cutting my leg-line, and keep proportions balanced for my height. I also know this outfit does not follow the rules. The boyfriend jeans swallow my figure and the rolled cuff cuts my leg-line, making my legs look short. The blouse is oversized and long for my proportions, and especially when left untucked, drags me down visually. I know all this, and yet I broke the rules willingly. The thing is, if you know the rules going in, then you can break them in a smart way. Same thing with proper fit. I like to explore how an item should fit, so that I can make the educated decision to go with it, or against it. I know these jeans are going to make my legs look stumpy, so I’ll roll the hem a little higher to show presence and pair them with low profile high heels. I know wearing an untucked blouse shortens me visually, so I’ll make sure it’s in a soft drapey texture, and I’ll push the sleeves up to my elbows. Two oversized, shortening clothing items paired together in one outfit? 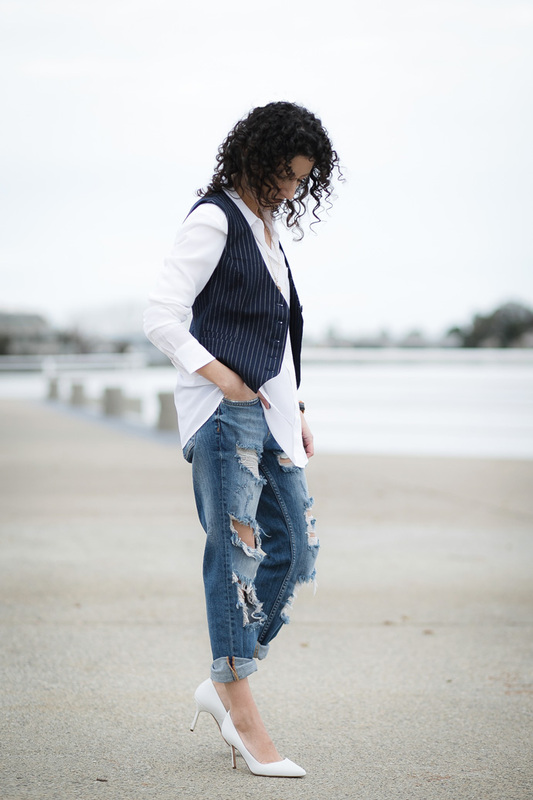 Throw on a structured, cropped, top layer to help wrangle the proportions. It’s not the most flattering look I’ve ever put together, but it’s one of my current favorites and I felt great wearing it. So pretty! Love this whole look! Great jeans! Hi Anu! Thank you! It’s been so long since I was in grade school, I forget how teachers dress for class! Maybe you can wear them on casual Friday? Do you have casual Friday in Finland? Hi, Kelly! Well, we don’t really have any kind of casual Friday but we have days with a certain theme. We teachers can dress quite freely here in Finland and the school trusts that we all know how to do it. Of course the weather puts the limits when you have to go out on a break. Anyway, the combination is swell and I try it at least at home. If you are going to break the rules, do it well! And you have. Like you, I generally follow the petites rules, but I’ve learned you can make other things work with attention to detail and proportion like you have suggested. Today’s look suits you very much Kelly. Thank you for sharing I love your work! I’m learning so much from you! I just discovered your blog a few weeks ago. Thank you for the inspiration! New to your blog here, myself a fellow scientist. Just noticed that your writing is very concise and analytical, refreshingly different from the mass of mediocrity out there in fashion blogs. I had suspicions that you were an engineer but at least I got the STEM part down. Keep up the great work.